Tucker, a golden retriever, has been comforting mourners at Gately Funeral Home in Melrose for nine years. As a funeral home director in Pittsfield, Rob Dwyer has worked with many grieving families. But when a young girl became overcome with emotion and rushed out of her grandmother’s service, he called on a special staff member at Dwyer Funeral Home to help: Greyce, a 2-year-old Chesapeake Bay retriever. 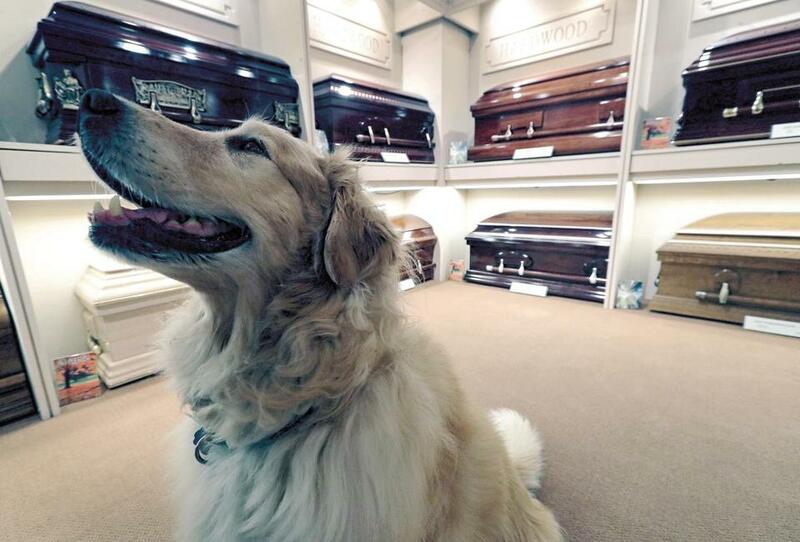 It’s a trend starting to grow among funeral homes in Massachusetts — offering the services of a therapy dog to comfort bereaved families during planning meetings, wakes, and funerals. Therapy dogs are also offered by the Gately Funeral Home in Melrose, and at least six other funeral homes are currently training therapy dogs, according to Margaret Nolan, executive director of the Massachusetts Funeral Directors Association. A spokesperson for the National Funeral Directors Association said that, anecdotally, the trend has increased within the industry, especially in the last four years. He added that Greyce’s presence, available upon request, also makes the experience positive for children who have never been to a funeral before. Melissa Sears, a Pittsfield resident, said that Greyce’s presence at her mother’s funeral was “a real comfort,” especially to the 15 grandchildren in attendance. According to Dr. Deborah Linder, associate director of the Tufts Institute for Human-Animal Interaction, there could be a scientific explanation for the positive impact therapy dogs can have on grieving families. Those effects, Linder said, can include reduced blood pressure and anxiety. One study showed that humans had decreased stress hormones after just five minutes of interacting with a therapy dog. The research comes as no surprise to John Gately, director of Gately Funeral Home. He has offered the services of his golden retriever, Tucker, for the past nine years. It started off as an experiment, after Gately guessed that his clients might enjoy interacting with his dog. Tucker was a hit, and has since gone to work with Gately almost every day. Catie Edmondson can be reached at catie.edmondson@ globe.com. Follow her on Twitter @CatieEdmondson.